Preshrunk and machine washable. No longer do you have to spot clean the the ticking while it is on the latex. 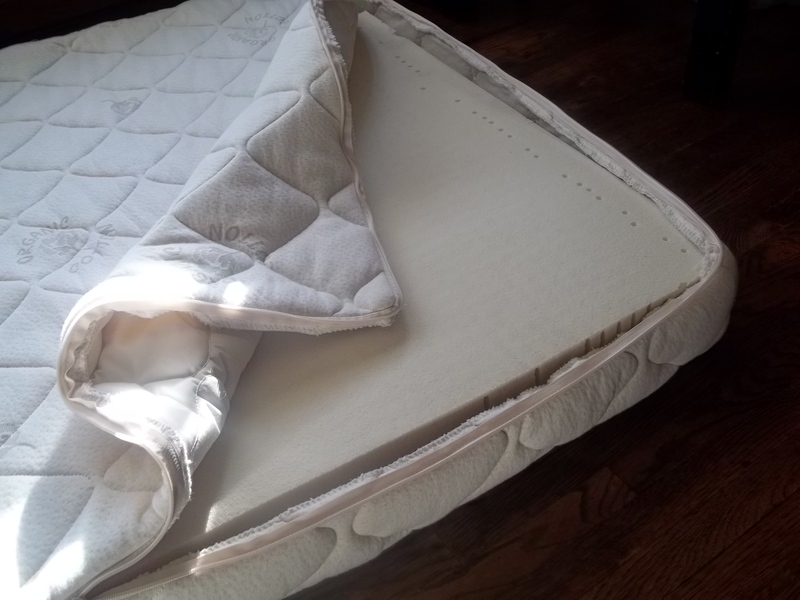 Freshen your entire mattress by washing this ticking. This knit case will flex with your body and the latex as you move. The inherent stretch of knit fabrics lets their looped threads pull apart from each other when pressure is applied. While this double knit fabric is actually fairly thick for just one layer of fabric, those we endearingly call “latex purists” like that they can be completely absorbed by the latex with this case. Every pressure point can be entirely soothed through this ticking. Having just one simple layer of fabric, this ticking is very affordable. With its one layer of fabric, it protects the latex from dust and debris, but not from heat sources, sunlight. It may give the latex a lesser life than the thicker quilted ticking. To compensate for its thinness, some add a layer or two of wool batting around the latex and under the ticking. The wool batting’s thickness protects the latex and softens the latex’s bounce. Since the wool batting does not come quilted, you save the cost of the quilting and thus maintain the affordability of the knit ticking. As you put consistent pressure sleeping on the latex, you may notice that one slab or another starts to stretch a little farther towards the edges than the others. 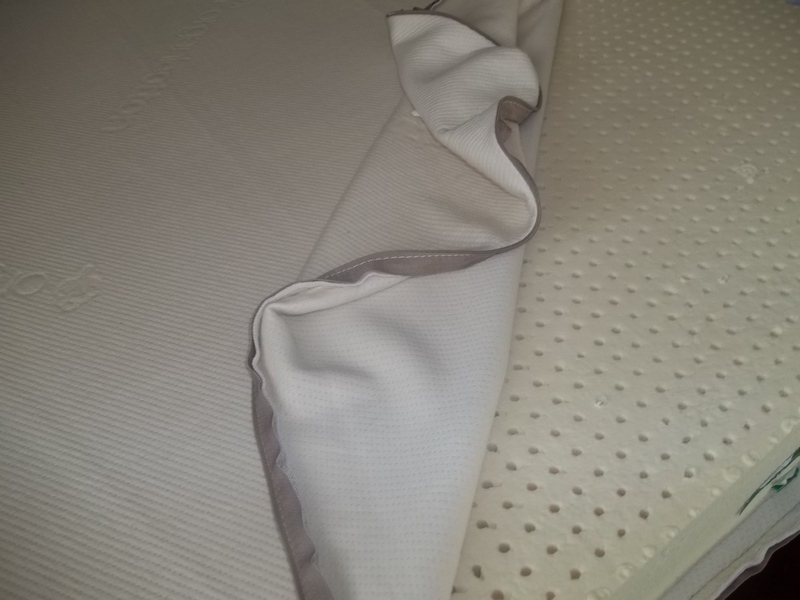 The clean lines of your mattress can be renewed by unzipping the ticking and flopping the layer back into place. A layer or two of wool batting wrapped around the latex will serve as extra strength and slightly prevent this occasional shifting. If you need help picking which firmness of natural latex might be comfortable inside your knit ticking, check out The Banana Test post and give us a call if you have further questions. With our soft double knit fabric on top, this ticking made for your DIYing will make your mattress feel and look better than your conventional mattresses. The rolling diamond quilted pattern adds a refined look to your mattress. Its thickness serves your comfort as well as protection of the latex layers hidden inside. The less exposed to elements like heat, sunlight, and poor air quality, the longer your latex will stay fresh. This 1″ layer of wool is enough to cool your sleep with its temperature regulating abilities. It is also enough to act as a flame retardant if needed. This is the simplest build with the most components to it. Zip the ticking shut around the fill and you have a mattress. This ticking with its two layers of organic cotton fabric and layer of wool has a lot to it, add the cost of quilting the layers together and you have our most expensive ticking. Some find the thickness to stiffen the feel of the latex slightly. While not a significant change, those we call “latex purists’ tend to avoid the extra fabric between them and the latex. If you need help picking which firmness of natural latex might be comfortable inside your quilted ticking, check out The Banana Test post and give us a call if you have further questions.